valley of Kali Gandaki, Marpha and Jomsom. Travelling Folks if you are the admirer of the deepest gorges, tallest mountains,snow covered slopes, views of glaciers and icefalls along with breathtaking views of rural society, forests and hilly terrain then Dhaulagiri Round Trek will be the preferred choice for your trekking ambitions.The trek to Dhaulagiri is often described as the trek to hidden valley of Dhaulagiri circuit. The Himalayan pass of more than 5000m offers breathtaking views of Dhaulagiri range, Annapurna range, Neelgiri and other astounding Mountains of Nepal. The rocky ravines, strenuous trail and adventurous terrain would require the experienced guides for you to get maximum excitement while trekking in this region. 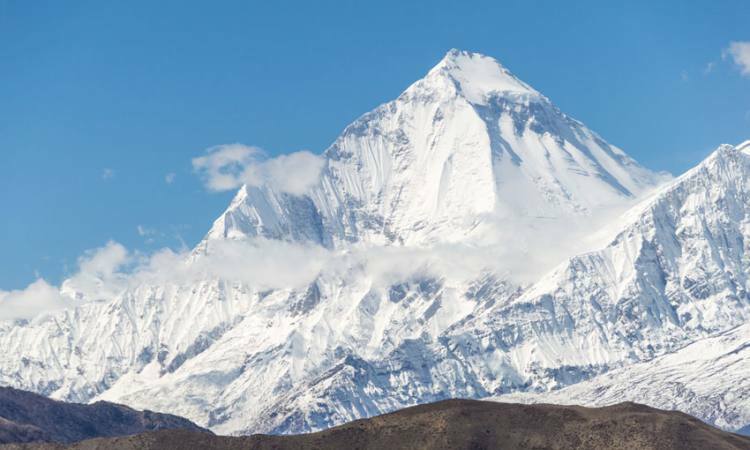 The Dhaulagiri trekking expedition is out and all the wilderness to the extreme. The trekking in this region means the exploration of the wild. Let your imagination flourish in the recently reopened long kept secrets like Gankaki Gorge. Like in other trekking trails of Nepal, this trail too provides ample time to witness the rural environment of Nepal along with rich natural and cultural attractions. The experience of the apple village i.e. Marpha the clustered village of Thakali origin people and the natural hot water springs could be the added bonus for the trekkers. Let your wilderness holiday in the hands of experienced team of Backpacker and we would simply provide you challenging experience to rest and explore escaping from your hectic life. Come explore with us, we would not leave a single stone unturned while serving you to realize your wilderness adventure dream. Pack your bags; Backpacker is here for fellow trekkers. Day 02Pre-trip meeting and sightseeing around the Kathmandu valley. Day 03 Drive to Beni (850m) by bus - 8 hrs. Overnight at tented camps. Day 04Trek to Babiachor (950m) - 5 hrs. Overnight at tented camps. Day 05Trek to Dharapani (1,400m) 6 hrs . Overnight at tented camps. Day 06Trek to Muri (1,850m) - 5 hrs. Overnight at tented camps. Day 07Trek to Boghara (2,080m) - 6 hrs. Overnight at tented camps. Day 08Trek to Dobang (2,520m) - 5 hrs. Overnight at tented camps. Day 09Trek to Choriban Khola (3,110m) - 5 hrs. Overnight at tented camps. Day 10Trek to the Italian Base Camp (3,660m) - 7 hrs. Overnight at tented camps. Day 11Acclimatization and rest day. Overnight at tented camps. Day 12Trek to the Glacier Camp (4,210m) - 6 hrs. Overnight at tented camp. Day 13Trek to the Dhaulagiri Base Camp (4,740m) - 7 hrs. Overnight at tented camps. Day 14 Another acclimatization and rest day. Overnight at tented camps. Day 15Cross the French Pass (5,360m), then trek to the Hidden Valley (5,200m) - 6 hrs. Overnight at tented camps. Day 16Cross Dhampus Pass (5,200m), and trek to Yak Kharka (3,680m) - 6 hrs. Overnight at a tented camps . Day 17Trek to Jomsom (2,710m) - 5 hrs. Overnight at tented camp. Day 18 Morning flight to Pokhara - 30 mins. Sightseeing around Pokhara. Overnight at a hotel. Day 19Drive back to Kathmandu (1,345m) and farewell dinner. Overnight at a hotel.